Polls are open from 7 a.m. to 7 p.m. in Cave Spring today as residents decide if they'll allow liquor sales in the city. Plans for a micro-distillery downtown hang in the balance. Elections Supervisor Judy Dickinson, who's also the clerk, said she's expecting a relatively strong turnout at the precinct in City Hall, 10 Georgia Ave. There are four questions on the ballot. One asks about sales of distilled spirits by the drink. One asks about package sales. Those each cover Monday through Saturday. The other two questions ask about liquor by the drink and by the package on Sundays from 12:30 p.m. in the afternoon to 11:30 p.m. at night. Only residents of Cave Spring are eligible to vote in today's election. Dickinson said there are just over 600 on the active list. The city already allows beer and wine sales by the drink and by the package. A referendum in 2015 that approved Sunday sales drew 269 voters. The last city election, to fill council seats in 2017, was decided by 230 people. Early voting started Feb. 25 and signs urging people to "Vote Yes" have been popping up all over town. Sandra Lindsey, executive director of the Downtown Development Authority, said passage opens the door for more economic activity in the form of tourism. Two businessmen are planning to open the Cave Spring Distilling Co., using water from the city's namesake spring to make flavored spirits. They want to rehabilitate and use a long-vacant historic building at 24 Alabama St., next to The Peddler antique store. Approval of package sales would allow Caney McStotts and partner Garrett Rothman to include a retail shop instead of having to sell their product to a wholesale distributor. By-the-drink and Sunday sales would let them add a tasting room and on-site tours to draw tourists interested in craft liquors. "The latest craze is to sample locally sourced ingredients at a regional microdistillery," according to Lonely Planet, an adventure travel site. It recently published a list of suggested destinations ranging from Boston to Japan and Australia — and including the Kentucky Bourbon trail. The Floyd County Schools Board of Education settled into its new schedule of meeting on the third Monday of the month Monday night with officials giving recognition and updates to the community. During the 5 p.m. caucus in Superintendent Jeff Wilson's office, the head of the school system gave a brief update on the tuberculosis case at Model Elementary and Johnson Elementary that was announced in late February. "We haven't been made aware of folks getting TB from that incident," Wilson said. He restated the update in the regular board meeting and added he and the system would not hide anything from the public. "We're not gonna hide anything we know," he said. An update was given by David Van Hook, director of facilities, who informed the board of the progress made on the Armuchee High School gymnasium thanks to a lack of rain. Van Hook also gave suggestions on how to save construction costs with the Pepperell Middle School construction project which will begin later this year. The board voted to table the facility use policy which would have received its second reading Monday night. Discussions on who should and would be allowed to use school facilities for a fee were discussed in caucus Monday night with the board ultimately deciding to table the policy until they could come up with a revised version. "We have some things we would like to tweak after our discussion tonight," Wilson said. The competitive interscholastic activities policy passed its first reading which would reinforce the state policy that prohibits a school to hold a student back for athletic purposes. "Everybody in this room knows that does happen, not at our schools, but it does happen," Wilson said. "It wasn't really legal before but now they have made it very clear." The policy is mandatory statewide, he said, and it will hurt other school systems. The new policy also affirms that school principals are over athletics. Other items approved Monday were the minutes from last month's board meeting, the financial records from January and changes in personnel which included 12 retiring teachers and other staff including Armuchee High School Assistant Principal Dan Tibbets. Also approved by the board was the selling of surplus buses the system could no longer use and to allow the superintendent to draft a proposal for Mountain Education to bring before the board at a later date. In the academic spotlight Monday night were nine county students who were not only recognized during the board meeting but also set up a civic engagement fair at the central office media center. Students like Coosa senior Lillian Chestnut had poster boards on how they engaged in the community. For two years Chestnut worked with the Public Animal Welfare Services to help increase adoptions. She worked with the organizations social media and even adopted one of the dogs herself. After high school Chestnut wants to become a graphic designer and already has tried her hand at some. Some may recognize her artwork which was featured on the cover of the November Taste and Toast issue of V3 magazine. Chestnut and the eight other students who were able to attend the meeting Monday night received certificates from the board members and will also receive the Georgia Department of Education's Civic Engagement Seal on their diplomas. The board gave Wes Conley of Armuchee High School a certificate of congratulations for winning the state wrestling tournament in the 113 pound weight bracket. Model Middle School's Sara Grace Abernathy, a sixth grader, was recognized for winning the 2019 Floyd County Schools Gifted Oratorical Contest and recited her speech on optimism versus reality for the board. Following Abernathy was Johnson Elementary who was the school of the night and was presented by Principal Tanya Welchel. In it's 243rd running, take that number with a grain of salt, three people stood out for their ability to stretch the truth at the Big Fibber's story telling contest over the weekend. From left are Stacie Marshall of Rome, first runner-up; Paul Strickland of Covington, Kentucky, the 2019 Chamption Fibber award winner; and Gary Buchanan of Creston, West Virgina, came in third. The Big Fibbers Festival is made possible by the support of the Rome Area Council for the Arts, Chiaha Guild of Arts and Crafts, Sara Hightower Regional Library and other sponsors. 2019 featured teller Bill Lepp of Charleston, West Virginia, who helped kick off a weekend of storytelling. Sara Grace Abernathy of Kingston, a sixth-grader at Model Middle School, along with ASL interpreter Gola Burton, right, at the Big Fibbers story telling festival on Friday night. Abernathy previously won the Debby Brown Young Tales competition. • His love of racing cars keeps him on the go. Mike McEntyre runs a rag over his door car, a 1996 Chevrolet Beretta with a 565 cubic-inch engine. Mike McEntyre with his winnings from a recent race. Mike McEntyre built this junior dragster for his son Braxton, 11, last year. As long as Mike McEntyre is doing something with cars, he's generally happy. Sometimes that means he's supervising his staff members during a workday as they rotate and balance a customer's tires, and other times it means he's roaring down a racetrack in a custom-made dragster on the weekend. "I'm just glad to get to do what I do," he says. "I love doing it every day for a living. Not many people can say that. I don't dread going to work because I enjoy cars ... I get to work with them all day, get to fool with them of a night, get to hear about them at supper and get to talk about them at breakfast." It's true: McEntyre's life revolves largely around automobiles, whether he's behind the desk at McEntyre's Auto and Discount Tire Service or he's traveling to a race. It becomes apparent over the course of a conversation with him, though, that racing is his love when it comes to cars. He's spent considerable time hauling his cars to tracks around the Southeast and even building and selling the highly-specialized vehicles out of his shop in the Newtown area. The son of Emory and Sylvia McEntyre, Mike grew up in Calhoun, and cars have been a part of his life since he could remember. His father ran an old-fashioned filling station for years here near the interstate. "I was born and raised in basically a filling station," Mike says. "We were full service ... when I was young, we just fooled around with cars, and that was our living." His father was lightly involved with drag racing, and that's where Mike's interest in fast cars began to develop. "I started helping him out with his stuff when I was little, when I was 5 or 6 years old, and that was just the highlight of the weekend if we got to go to the races," he says. "But Daddy never was quite into it the way I've gotten into this stuff." "He would take the fourbarrel (carburetor) loose and let me drive it, and I would run in a little class called the trophy class," Mike recalls. "I was driving a full-sized car when I was 10 years old. It was kind of dangerous, but it wasn't fast, and that's how I got involved in it." His interest soon evolved from racing the cars to actually building them, and up until recently, he sold cars fairly frequently. "For the last four years, I was doing one to two cars a year that I was building and selling," he says. "I've got cars in Florida, I've got cars in Texas, I've got cars in New England ... it's pretty neat to see a car that you've done and see it going down the track in New England or something." A well-built rear engine dragster can sell for between $35,000 and $55,000. Door cars (i.e. race cars with a sedan body as opposed to the single-piece body of a dragster) go for $35,000- $45,000, depending on the options included. Mike recently took some time off from the endeavor when it began to interfere with actual racing, however. "I was having to work day and night to get cars done because I had deadlines," he says. Last year, he built a junior dragster for the first time. The car went to his son, Braxton, 11. The unveiling was emotional. "We actually brought it over here and sat it in the building one day, and his sister kidnapped him ... we had it stashed somewhere (during the building process)," Mike says. Braxton began to ask questions about his father's unusual hours as the car came together, but ultimately, the big reveal stayed a surprise. Mike has a video on his phone of the first time Braxton saw his dragster. The boy enters the garage and immediately bursts into tears at the sight of the car. "He's very smart, so once he saw it, he knew what had went on," Mike says of his son. "He was like, 'I see now why you were gone.'" Racing rules say that until he turns 12, Braxton isn't supposed to go faster than 8.90 seconds in an eighth of a mile, a speed which represents the index, or optimal performance speed of the car. The max speed Braxton is allowed to run falls between 79 and 80 miles per hour at this index, Mike says. "He's hovering around his index now," he says. "There are a lot of street cars that aren't running that fast." Report ranks health of Floyd Co.
• The annual analysis looks at factors affecting length and quality of life. About one in six households in Floyd and surrounding counties experience severe housing problems ranging from overcrowding, a lack of kitchen or plumbing facilities or the need to spend more than 50 percent of their income on shelter. The issue has a ripple effect, according to the annual County Health Rankings released today by the Robert Wood Johnson Foundation and the University of Wisconsin Population Health Institute. "High housing costs make it difficult for families to afford other essentials that contribute to good health, such as healthy food, medicine or transportation to work or school," the analysis states. Forsyth County ranks healthiest in Georgia, followed by Oconee, Cherokee, Fayette and Gwinnett. The least healthy counties are generally in the southern part of the state: Warren, Twiggs, Quitman, Clay and Miller counties. Floyd County ranks 54 out of the 159 counties for overall health, which looks at both the length of life and quality of life in the population. Bartow County is tops in the area at 33; Gordon County comes in at 61; Chattooga ranks 83 and Polk trails at 91. The percent of households classified with housing burdens ranges from 16 percent in Bartow and Gordon to 17 percent in Polk to 18 percent in Floyd and Chattooga. Georgia's average is 18 percent, but in the healthiest U.S. counties it's half that. "Our homes are inextricably tied to our health," said Dr. Richard Besser, RWJF president and CEO. "It's unacceptable that so many individuals and families face barriers to health because of what they have to spend on housing." CountyHealthRankings.org, call attention to key drivers in health and the differences from place to place that affect how well and how long people live. The four main areas of investigation were health behaviors, clinical care, social and economic factors and the physical environment. Higher-than-average rates of adult smoking, adult obesity and people without medical insurance are among the health factors of concern in the five-county area, but there are bright spots as well in the report. 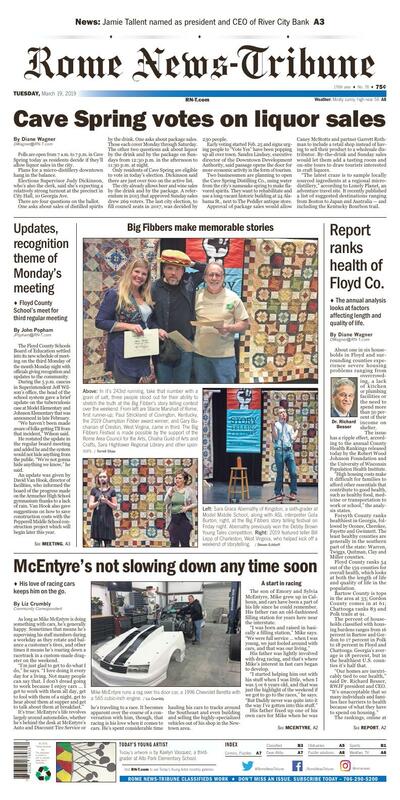 • Floyd County ranks among the highest in the country in the ratio of primary care physicians to residents, 770 to 1. The top U.S. performers average 1,050 to 1. It also logged a 10 percent rate of alcohol-impaired driving deaths, compared to the 22-percent state average; and a high school graduation rate of 92 percent compared to 81 percent statewide. Additional areas of concern where Floyd does worse than the state average include the 53-percent of residents who have some college, a 5.2-percent unemployment rate and the 27 percent of local children who live in poverty. Residents also recorded a higher rate of preventable hospital stays, equal to 5,977 per 100,000 people. in Georgia, it averages 4,851 per 100,000 and the healthiest communities nationally average a rate of 2,765 per 100,000. The other nearby counties also top the state average, with the rate at 5,201 per 100,000 in Gordon; 5,585 per 100,000 in Polk; 5,645 per 100,000 in Bartow; and 5,645 in Chattooga. • Polk County's bright spots also include a 10 percent rate of alcohol-impaired driving deaths and a lower-than-state-average rate of income inequality. That's the difference between the to 20 percent and bottom 20 percent of earners. The county also nets a 7.9 on the food environment index, which calculates access to healthy food and the ability to afford it. Georgia's overall rating is 6, which is much lower than the 8.7 average for the top counties nationwide. Areas of concern in Polk included the graduation rate, level of education overall, and high rates of violent crime and injury deaths. The number of reported violent crimes was equal to 569 per 100,000 people, compared to 388 per 100,000 for the state average and 63 per 100,000 in the safest U.S. counties. • Gordon County's high school graduation rate of 94 percent stood out as a high mark in the health factors, along with a relatively low rate of sexually transmitted diseases equal to 251 per 100,000 people. It's the lowest in the area and significantly lower than the statewide average of 614.6 per 100,000 people. Income inequality is within healthy-community bounds in Gordon as well, with a ratio of 4.3 between the top and bottom percentiles, compared to 5.0 for the state and 3.7 in the topper-forming counties. The county's uninsured rate of 20 percent, however, is the highest in the area. Georgia's average is 15 percent and the healthiest U.S. communities average 6 percent. About 25 percent of Gordon's adults and 8 percent of its children are without medical insurance, according to the report. • Chattooga County's strongest points are its food environment index of 7.8 for access and affordability of healthy food, and its 4.7 percent unemployment rate equal to the state average. The county's 86-percent high school graduation rate beats the state average but is flagged as a potential area of concern in the report. Just 36 percent of the adults have some college education. Chattooga also nearly matched Polk in the rate of injury deaths: 94 per 100,000 people compared to 99 per 100,000. Statewide, the rate – using data from 2013 through 2017 – was 63 per 100,000. • Bartow County scored well on the income-inequality scale and 48 percent of the population got flu vaccinations, compared to 43 percent statewide and 52 percent in the top counties nationwide. The county ranked lowest in the area in the premature death rate, which is the number of years of potential life lost before the age of 75 per 100,000 people. It's calculated giving heavier weight to the deaths of younger people. Bartow came in at 8,200 per 100,000 compared to 8,800 for Floyd, 9,000 for Gordon, 10,600 for Polk, and 10,700 for Chattooga. The statewide average was 7,700 per 100,000 and the top-performing counties in the nation averaged 5,500 per 100,000. A major area of concern was the violent crime rate equal to 468 reports per 100,000 people, using data for 2014 and 2016. Today's artwork is by Kaelyn Vasquez, a third-grader at Alto Park Elementary School.